Melynda graduated from the University of Kentucky in 2004 with a BA in Political Science and Integrated Strategic Communications with an emphasis on Public Relations. Upon completion of her undergraduate work, Melynda served as a Hall Director for the University of Kentucky and earned a Masters of Public Administration from the Martin School in 2006. Since then, she has served as a Legislative Aide for the Lexington Fayette Urban County Government City Council and Executive Director of another CASA program. Melynda was recently named 2018's National CASA Executive Director of the Year for the entire United States (that's top billing throughout over 300 CASA branches, nationwide). In her free time, Melynda enjoys running, traveling, hiking, meeting new people, spending time with her husband and experiencing new cultures! Jenifer is a graduate of the University of Kentucky, where she earned a Bachelor of Arts in Political Science. She is a native Kentuckian who was born in Louisville but chose Lexington as her home after college. Previously, Jenifer has worked for Girls on the Run Central Kentucky focusing on instilling healthy lifestyle habits in elementary and middle school-aged girls. In her free time, she enjoys playing tennis, practicing yoga, reading, and taking her dog on runs! A native of Hickman County, Kentucky, Jessica earned a degree in Agriculture Science with an emphasis in Communications from Murray State University and a masters in Intercultural Service, Leadership and Management from the School for International Training. Jessica previously worked in fundraising and marketing for Central Kentucky Riding for Hope and The National Quilt Museum. She served three years with the U.S. Peace Corps in Tanzania and as a communications and programming strategist for the Alliance for Haiti’s Children in La Vallee, Haiti. Jessica loves traveling and learning about different cultures. She also spends her free time hiking and taking pictures of her cats, Abel and Jade. Amanda was born and raised in Lexington, where she graduated from the University of Kentucky in 2011 with a BA in Anthropology. Her professional experience in the private, public and non-profit sectors has given her the opportunity to work with a variety of clients and customers, enabling her to hone her administrative skills in a way that supports the individual and the organization. Amanda loves spreadsheets, organization and learning new things. In her free time, she can be found reading, binge-watching Netflix originals, and updating her Instagram page with pictures of food and her cat, Abbey Road. She enjoys spending time with her husband, Ben, as they chase after their toddler, Isaac. Emily is a graduate of the University of Kentucky, where she earned a Bachelor of Science in Hospitality Management with a minor in Business. She is a Nashville native, and recently moved back to the Lexington area. In her free time she enjoys, traveling, kayaking, playing with her 3 rescue dogs, and spending time with her fiancé, sister, and friends. Cameron is a graduate from the University of Kentucky, where she earned a Bachelor of Arts Degree in Sociology. She was born and raised in Nashville, TN, and plans on moving back after her time with CASA of Lexington. Cameron is employed by AmeriCorps VISTA and is currently participating in her “year of service” with CASA of Lexington. She works as a part of our Development Team among many other things.In her free time, Cameron enjoys spending time with her family, traveling, and hiking with her dog Rupp. Kyrsten is a graduate of the University of Kentucky, where she earned a Bachelor of Arts in Social Work. She came to CASA as a practicum student, went through volunteer training and took on a case. After being a volunteer advocate for over a year, she joined the staff as a Volunteer Manager. Kyrsten is a Lexington native and lives with her husband and puggle. In her free time, she enjoys reading, cooking, shopping for bargains and spending time with family. Jeanne graduated from the University of Kentucky with a BA in Communications and from the University of Notre Dame Law School with a JD. Jeanne was in private practice before leaving law firm life to spend more time raising her two children. Over the years she found herself involved in many volunteer and work projects focused on children, including being a development director for a new school construction, and a youth counselor at a residential home for children. Jeanne has been a CASA volunteer since 2014 and welcomed the opportunity to help bring CASA to her longtime home, Woodford County. She lives in Versailles with her husband and two dogs. In her free time Jeanne loves to be with family, read, hike, travel, watch UK and ND athletics, and play the fastest growing sport in America, pickleball. Chloe is a graduate of the University of Kentucky with a Master of Science in Counseling Psychology. Her professional experience has included counseling in community mental health and private practice, with an emphasis on working with children and families. Originally from San Francisco, CA, Chloe moved to rural central Kentucky where she was raised. She has called Lexington home for over 30 years. In her free time, she enjoys spending time with her family, reading, cooking, traveling and being outdoors. Cara grew up in Washington, but considers central Kentucky her home having lived here for 25 years. She attended Eastern Kentucky University where she earned her Bachelor’s degree. She then earned her Master of Social Work degree from the University of Kentucky in 2004. Cara was a clinician at Shepherd’s House, Inc. helping men in recovery make lifestyle changes that promote personal growth and long-term recovery until she took time off to raise her three children. She has been an active volunteer in public schools for the past six years. In her free time, she enjoys spending time with her husband and children, organizing, reading, hiking, playing board games, and learning new things. Margaret recently returned to Central Kentucky after a postdoctoral fellowship with the Department of Sociology and Tisch College of Civic Life at Tufts University. She earned a Ph.D. in Sociology and Gender and Women’s Studies in 2018 and a Master of Arts degree in Communication at the University of Kentucky (UK) in 2011, and while she completed her graduate courses, she worked full-time as the Assistant Dean for Research in the UK College of Public Health managing the College’s grant portfolio. Margaret’s research and teaching focus on the influences of gender and other social identity categories on culture, education, and health. She has volunteered as the Research and Advocacy Director for The Girl Project, a local feminist performing arts-activism education program for teenaged girls, for more than six years. Although Margaret grew up in the Pacific Northwest, she has lived in Lexington for almost 10 years with her husband (a professor of Chinese at UK), two dogs, and two cats. In her free time, she enjoys teaching yoga, traveling, being outdoors, singing in her church choir, and attending local arts, culture, and sports events. Livie graduated from the University of Kentucky in 2015 with a BS in Social Work. She focused on the Child Welfare field during her studies, completing the Public Child Welfare Certification Program. She began working shortly after graduation for the Cabinet in Bourbon County Kentucky, serving families and children directly affected by abuse, neglect, and dependency issues. Livie was born and raised in California, Kentucky, but decided to relocate to the Lexington area after college. She now resides in Bourbon County. She considers herself very family-oriented and enjoys relaxing at home with her husband and daughter and frequently visiting family members. The home is rarely quiet with two overly friendly dogs, a very old cat, and an infant crawling around! Her hobbies include sewing, shopping, and trying new things. Dennis grew up in Indiana, with a couple of sojourns in Alaska. He graduated from Hanover College with a Bachelor of Arts degree in Political Science. He subsequently obtained his law degree from Indiana University School of Law, and practiced for 31 years as a legal services attorney and public defender before retiring from state government. In that work, he represented hundreds of people who have the same issues which challenge the families of CASA children, and is experienced in working with the social workers, judges and therapists engaged with our children. He is married and has adopted four girls and a boy from foster care, who had two CASA volunteers themselves. In his free time, he enjoys helping his kids grow, hiking and serving as a volunteer chapter adviser to 50 young men in the Sigma Chi chapter at Hanover College. Liz Noffsinger grew up in Northeastern Kentucky. As a young teenager, she moved to Arizona. She subsequently received her B.A. in Psychology from Arizona State University and her M.S. in Clinical Psychology at Stanford University. Liz was a Therapist specializing in eating disorders and the family dynamic for many years and then took time off to raise her son, Grant. Liz has been married for over 25 years to Barry and lives in Lexington. Liz was an active CASA volunteer before becoming a full time Volunteer Manager and CASA Canine Handler for Matilda. In her free time, Liz prefers to be outdoors and spends many hours playing with Matilda! Matilda was born July 27, 2016 and was born to be a certified service dog. 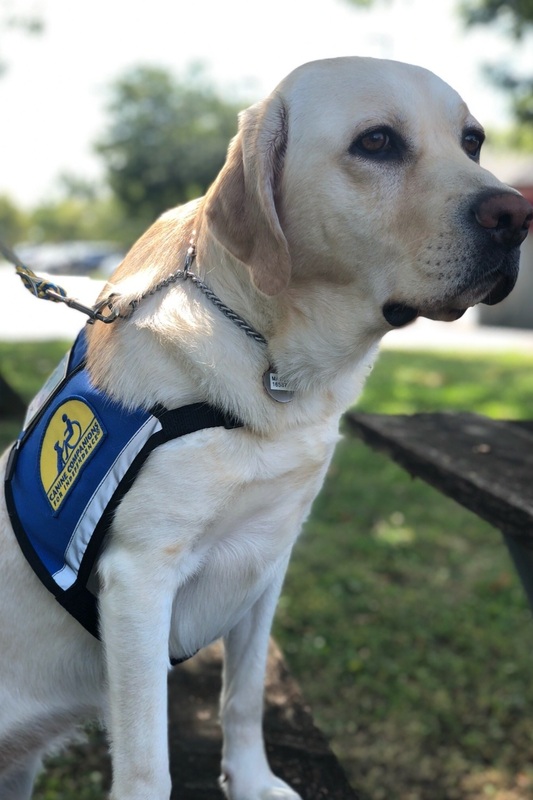 She was trained by Canine Companions for Independence in Delaware, Ohio and CASA of Lexington was lucky to have been accepted into the Canine Companions for Independence Program. CASA of Lexington received Matilda in August of 2018. Today, Matilda helps many children overcome traumatic life experiences by simply providing unconditional acceptance. Matilda knows up to 40 commands, and is the only certified Courthouse Facility Dog in the state of Kentucky. She attends court, home visits, school visits, and treatment facilities throughout the state. Matilda lives with Liz and her family when she is not working. Matilda loves playing with her dog friends, going on long walks, and making the lives of children in Fayette, Bourbon, and Woodford counties better.